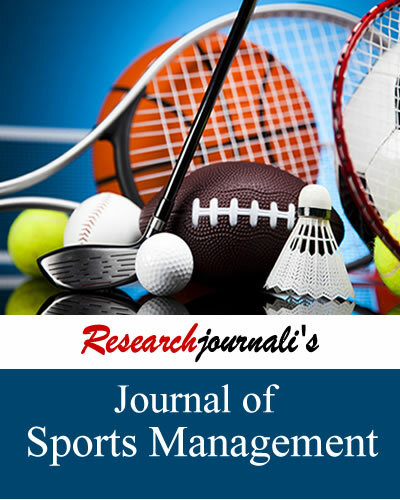 The Journal of Sports Management publishes scholarly research papers in the field of sports management and encourages new ideas on existing research. It covers number of areas related to marketing, governance, strategy, promotion, laws and policy issues in this area. Unpacking The Integrative Conceptual Framework For Assessing Perceived Brand Equity In Professional Sports Teams. Physical activities can promote cardiovascular and respiratory functioning and increased quality of life. To ascertain these benefits, this study sought the relationship between habitual physical activity level and cardiorespiratory fitness of 9 to 11 year old male children in Nigeria. Researchjournali's Journal Of Sports Management (RJOSM) publishes scholarly research papers in the field of sports management and encourages new ideas on existing research. It covers number of areas related to marketing, finance, governance, strategy, promotion, laws and policy issues in this area. The journal provides a forum for exchange of knowledge among academicians and researchers for advancement of research in sports management.